Palm Treo 700wx Smartphone is a combination of PDA and mobile cell phone offered by both Palm Sprint as an update to Verizon’s Treo 700w, addressing common complaints by power users that the Treo 700w does not have Bluetooth Dial-Up Networking (DUN) and comes with too little user available memory. 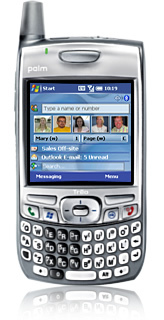 Palm Treo 700wx runs on Windows Mobile 5.0 Pocket PC Phone Edition operating system, the second Palm device on WM platform. Treo 700wx features 128MB (60MB user accessible) non-volatile Memory, Intel XScale 312MHz processor, 16-bit 64k colors 240 x 240 color TFT touchscreen display, 800/1900MHz nationwide digital phone, CDMA2000 EvDO network support which compatible with 1xRTT network, Bluetooth 1.2 wireless support, 1.3 megapixels with 1280×1024 resolution plus 2x digital zoom, automatic light balancing, integrated self-portrait mirror, video capture ability, full QWERTY key layout with backlighting, integrated number dial pad, support for MultiMediaCard, SD & SDIO cards, and weighs 180 grams. PDAStreet (dead link) concludes that while Verizon customers might be unhappy about it, the Treo700wx for Sprint delivers improved storage and performance. If you’ve been waiting to buy a 700w, but didn’t want to make the move from Sprint to Verizon, this is the time. mytreo (dead link) meanwhile concludes that while the 700wx addresses the memory problems of the 700w, the antiquated screen is still an issue for me. WM5 is an excellent OS, but requires more “clicks” to navigate than the Palm OS on the Treo 700p. Using the 700wx, I also missed the dedicated Calendar and Email buttons on the 700p. The Treo 700wx is probably best suited for business users who use Exchange and depend on seamless integration. For most other, users I believe that the Treo 700p is by far a better choice.